I'm not sure the guy behind you is going to be thrilled when he catches you banging away on your cellphone and/or Blackberry on the links, but the Soldius golf bag will certainly make it easy to stay in touch on your next golf outing. 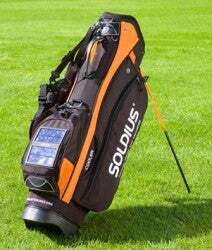 A nice-looking golf bag with integrated solar charger, it comes with charging points for over 250 cellphones, Smartphones and PDAs. Depending on sunlight, of course, your gadget can be fully charged in 3 hours. No price just yet, and it probably doesn't beat sending the caddy back to the clubhouse to recharge your RAZR and maybe pick up another hip flask.